Trainer Eric Haldane with the 2019 Devonport Cup winner Corykodi. Source: North West Greyhound Club. HOBBY trainer Eric Haldane has taken out the 2019 Group 3 Devonport Cup (452m) after his chaser Corykodi upset a star-studded field in Tuesday’s feature. Despite not jumping the fastest, Corykodi hunted up the rail and got to an early lead, which proved the difference as second favourite Just Browsing checked back through the field. The Paw Licking x Dayseas Astra product kicked strongly entering the straight and was able to claim the $25,000 winners cheque ahead of Hello Nugget and Lenard’s Boy. Favourite for the race Despacito failed to jump away cleanly from box five and was never in the hunt. Corykodi returned $5 at online bookmaker Sportsbet. Haldane, who said the winner “wasn’t the best dog in it”, prepared the dog for long-time friend, Queensland owner Claude Dacey. The trainer said the speedy beginning won Corykodi the race. “I’m rapt for the dog – he’s a very good dog,” Haldane said. 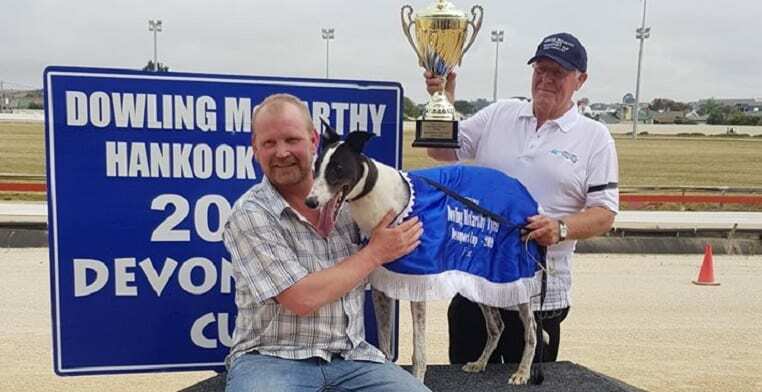 The Lauderdale-based trainer, who only has two dogs in his own kennel, revealed Corykodi will run again on Monday night and if all goes to plan they will target another Group race in Tasmania.